For Week 5 of the #SuperBloggerChallenge2018, one of the prompts really appealed to me more than the others. It asked me to reminisce on some of the best moments I've had with the blog. Even by normal standards, I have been blessed because I have some blogging highs that not many amongst a crowd of tens of millions of Indian blogs can claim to have achieved. Here are some of the best moments that Godyears has given me over the years. One of the biggest wins for me would definitely be winning the 'Best Creative Writing Blogger in India' at the country's first live blogging conference awards ceremony, Win'14. It came at a difficult time in my life and really was the start of an amazing year where over 10 of my short stories would also get published in various national anthologies. Winning the Best Blog from Kerala at the Indian Blogger Awards 2017 meant a lot too, ending another tough year with a smile. You won't believe it but it is 2018 and I still get recognized in medical conferences across the country and even social gatherings featuring random doctors for this one blogpost! I had written earlier too about the flawed Indian medical system and how things needed a radical approach for improvement. But somehow, that article in 2015 which was written over a period of nearly 3 weeks and was close to 3000 words (!!) struck a chord with the medical community in India first and then abroad over the weekend. I did not really notice it gaining traction initially and was already planning to write my next blogpost (some random movie review) when the calls started coming. First it was doctors. Then it was online medical sites. Then newspapers, news sites, news channels and yes, even BBC. By the end of that week, the article had been shared over 40,000 times just from the parent site, besides being copied in various websites and debated widely across news channels and social media. 3 years later, do I stand by what I said? Sadly, yes. I would still rather my child be a pole dancer than a doctor in India. The system is still in an unholy mess and nothing - infrastructure, resources, apathy to violence, hatred towards the community, flawed education systems, improvement in either quantity or quality - has changed. What is worse, I now know that most doctors agree with me. How I wish the powers-that-be had fought harder to prove me wrong. In 2017, the combination of being a Blogger - Doctor - Author paid off in a unique way, with the Changing Tomorrow Youth Summit inviting me to be a speaker in Jaipur alongside many celebrities from various fields (including actress Raveena Tandon and politician Sachin Pilot) and inspire an audience of over 1500 young minds to think beyond the normal choices shown to them. It was fun, reliving the journey that linked the above three titles. I think it was well received by the students too - at least there were no tomatoes and eggs flying in my direction so that counts as a win, I guess! One of the best things that came out of blogging was the new family I made. These fellow bloggers reveal their hearts and souls in their words and it is a wonderful way to know who matches your wavelength. And even though we are hundreds of miles apart, the opportunities to meet up arise via blogger events. I've been lucky to have attended a few over the years and met/made some awesome friends along the way who even today are there for me when real-life friends and family aren't. Today, I can walk into a dozen cities in India I have never been to before and there are blogger buddies I have never met before happy to see me and meet up. One of the biggest highs that has come from blogging was purely by accident. After doing TV Shows in 2016, I was stuck searching for a theme in 2017 for the A to Z challenge (Where you write every day of April except Sundays on a particular topic, each article corresponding with a letter of the month.) While randomly going through the net, I found a small heartwarming article that really made me smile on a day filled with bad headlines. And that got me thinking of all the similar inspiring real-life stories lost in between news of war and hatred. I ended up doing a series of Real-Life Heroes of Kindness where I found a person for every letter of the alphabet from all corners of the world who had done a kind deed. 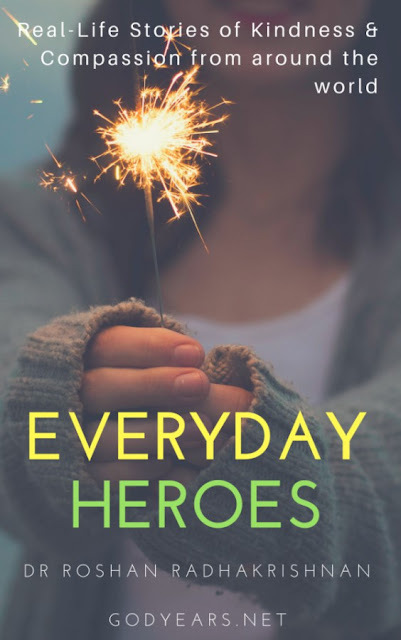 Instead of just writing about them, I tracked many of them down and talked to them directly or in some cases to the recipients of their kindness too. My main aim was to prove that kindness exists in this world if you choose to search for it and readers loved this series for how it restored their faith in humanity so much, I have continued it even after April has passed by. 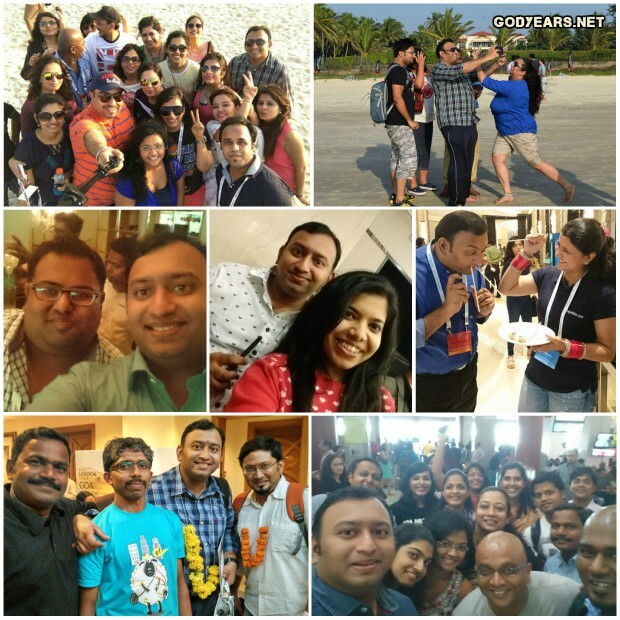 That was 5 of my top moments in this blogging journey. What did you think of them? Also, what has been the best blogging moment you have had? Do tell. Wohh..an award too..👏..way to go..
haha.. thank you. For me, back then, it was a huge deal. 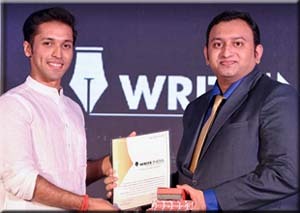 Lovely article , could connect to it , blogging gave me lots of happiness and bunch of lovely friends :) Congratulations for the award and yes your Viral post is too good and unique , wish could write something like that which can touch the chord of a common man . These are some really super cool achievements, Roshan. Great going and keep inspiring. Thanks Shilpa... let's see where this year goes. You are such an inspiration and a truly superduper bloggers. How you manage that even after having a full time job as a doctor beats me. What I love the most about you is your genuine voice. And I believe many get drawn to your blog because of that. Stay awesome. Thanks Rajlakshmi... means a lot. I try to offer something which each post these days. Such a great achievement and keep writing to inspire lives. Thanks. Glad if i can make anyone try a little harder. Kudos Doc- I am in awe of your blog series from AtoZ last year and have been reading them as and when you post them. Congratulations again, Roshan. You are one of the few bloggers who I admire so very much and it makes me so happy to see you achieve some brilliant things over the years. 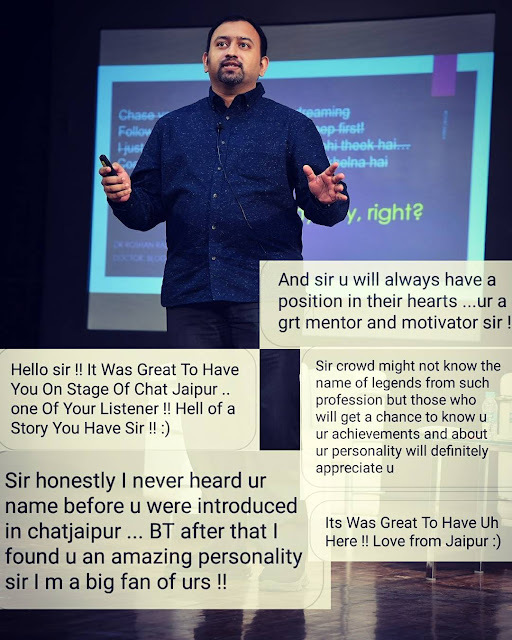 I have been following you since the time I started blogging and you are a true inspiration. Keep writing. All the best. Thanks Shalini. Means the world to me. Thanks. It has been awhile since I wrote a personal post, honestly. Congrats on all the achievements, Doc! You deserve all this and more. I am speechless. First I am so happy that I participated in this challenge. Otherwise I would have missed knowing so many super human beings. Your story is motivating beyond words. Dr Roshan hats off. Dr.Roshan, your blog is what I love to visit as I know there will be something interesting. I am amazed by the research you do, and you do it thoroughly. Always look upto your blog as the gold standard of blogging. You are a true inspiration Dr. Roshan for the way you juggle two jobs - medicine and blogging/writing. Like many, I look up to you and move on in this journey. You remind me of the quote - When the going gets tough, the tough gets going! :) Great post! Haha.. thanks. I try my best. Inspiring is a very small word to your achievements for a newbie like me. I am honored to be a part of this SBC alongside great bloggers like you. May you achieve many more heights and continue to inspire many more people. Thanks so much.. hope to do more in the years to come. 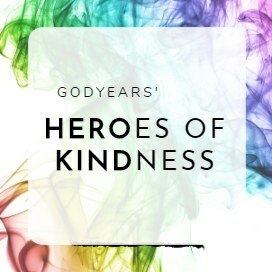 I followed your series of heroes of kindness series and it was great. 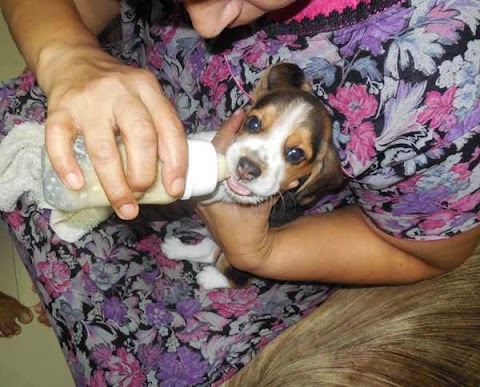 We need articles like that to beleive that kindness exists in the world still. I also read that famous article of yours about medicine studies and infrastructure in India. 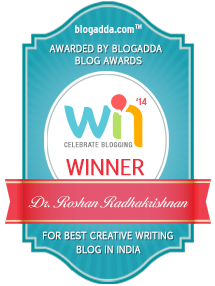 All the best Roshan and I wish you many more happy blogging moments in future. Beautiful moments and thanks for sharing them with us. These highs are definitely to aspire for. Roshan you are truly inspiring and amazing. May you keep on scaling heights. It was fortunate that we met virtually Dr.Roshan.Your journey inspires me every time I read. Hey sir,your work is really amazing and it is inspiring to see you create a lot of difference to the world with your writings and blogs..Your writing has created a true Aquarian era in the Indian blogging world with your thoughts and ideas .Your knowledge in variety of fields from movies, spirituality,arts,sports, electronic electronics etc shows you are so omnipresent..I have a teenie weenie doubt.From where are you getting all these amazing stories of kindness from around the globe and getting to interview so many great people just by sitting in your home town in Kerala and in the midst of your busy hospital schedule.? Thanks for all the compliments... I really should frame this comment for when I need positive reinforcement. Kudos to your journey as a blogger and doctor..I have to admit you are a really gifted person who is creating an example for all Indians by teaching all to Live life in their own terms sticking strongly to your ideaologies and beliefs..Keep creating an impact through the blogging arena around the world with your amazing stories and articles..
Aww... thanks Bushra :) Means a lot. 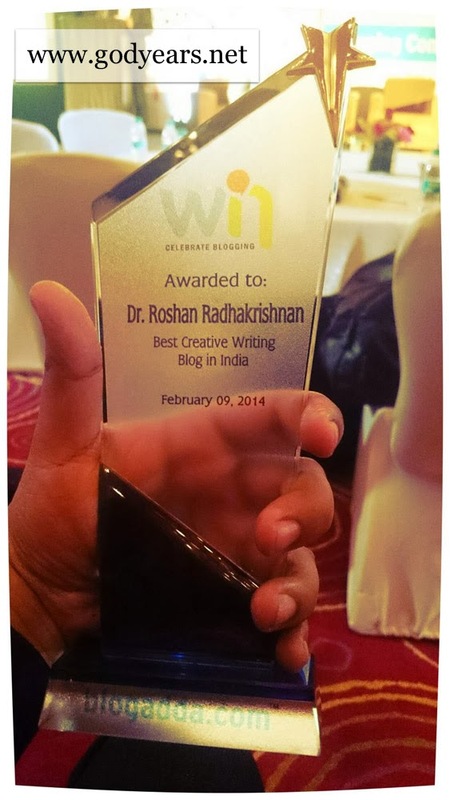 Blogging has truly rewarded you Roshan. Wish you many more success in the coming years. Going viral and getting a call from BBC is the real reward so far. Your viral series is just something else! Now getting an award and also getting viral for good reasons, is what I woudl want too. Thanks Zainab :) Here's wishing you your first viral post this year! Wow doc I dint know about the viral medical system article. Kudos on that. Awards that you received are truly well deserved. You have no clue how happy this post makes me and gives me hope that there is so much to do before I give up on blogging! Congratulations for your award(s). You are an awesome blogger and an inspiration for many. That's truly inspiring. Blogging gives me a lot of peace, in fact creative writing in any form does that to me. But I am an introvert and coming out and being an active Blogger is tough for me. But narratives like these help me break the shell. I used to be a major introvert, in fact. This form of an online family to talk to really helped. Your journey is truly inspiring, Roshan. One can only imagine the kind of love, support and respect blogging has helped you garner from people from different walks of life. I look up to you for the wonderful balance you've maintained between your professional life and your passion for writing. That's just wonderful . You have won many hearts along with the award . Congrats . You inspire me . Where can I read your post doctor wali ? ?